Sydney Shop Girl: Life This Week 18/6/2018: Show Us Your Snaps #5. The date is in my memory banks. From June 20, I will be armed with enviro bags (plus or minus just a few of my Lulu Lemon shopping bags) every time I head to Woolies. It was cast iron cookware day at Aldi recently and I loved seeing everyone's new finds on Instagram. There's something timeless about red, grey or white enamel and it looks so amazing in the kitchen. I've got more than my fair share of it so I bought this white and grey doorstop instead. I've been meaning to get one for the double doors for ages. So cute and so much easier to move around with a foot than fiddly rubber door stoppers. I stocked up on mint sauce while I was there. It's peak lamb season at our place right now and mint sauce is the ying to lamb's yang. Recipe Tin Eats has this amazing and easy recipe for Teriyaki Chicken Meatballs which has been very popular at SSG Manor 2.0 this week. The sauce is so simple. Well worth sourcing cooking sake and mirin at your local Asian grocer. I got a bit creative at my desk at work when I didn't have it in me to walk to my favourite cafe for the day's skinny cap. 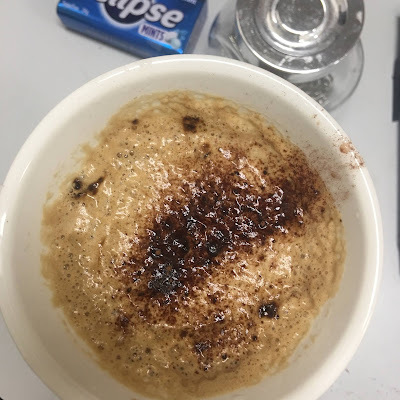 A teaspoon of Moccona plus a sachet of Nescafe Cappucino mix turns out to be a pretty good substitute for the real thing. I ended up with a coffee that wasn't too sweet with a decent kick of caffeine and that all important creamy froth. A shake of cocoa powder over the top made it look the goods. I've been making the most of the clear sunny days that we've been treated to this winter. We took the light rail to Dulwich Hill from Central one weekend. The journey was half the fun as we creaked and swayed our way through the Inner West. Familiar suburbs look different from a train carriage and you really can't complain about feeling the sun's warmth through the window on your ride. Similarly, clear evenings have been the perfect excuse to explore more of VIVID after an early dinner. These are my favourites from Chatswood's VIVID. Are you ready for plastic bag free checkouts at the supermarket? What's the most adventurous way you've experienced instant coffee? What?? I can't smuggle plastic bags from NSW across the border to ACT anymore? What is a girl to do. We've been "plastic free" for a while. Second nature to take our shopping bags with us each trip. Glad we were forced into it to be honest. It's a bugger when we forget them though. That jelly fish looking VIVID pic is very cool. I'm kind of ready for the change. I'm stressed about doing big shops and having enough bags with me but figure I will do more small trips (wah) and figure out from there how many I might need. And there I was thinking I was the only one who combined regular coffee with the mocha sachets. SNAP!! They start the no single use bags here on July 1. I think there will be much confusion and people refusing to pay in the area where we live. We will carry some bags I guess. Sigh.